Experience an evening of balmy breezes and changes in latitude as our trio of well versed Florida style musicians welcome your guests to the event. They will perform a multitude of traditional and contemporary crowd-pleasing tropical, easy listening and party standards, including a healthy dose of Jimmy Buffett classics. 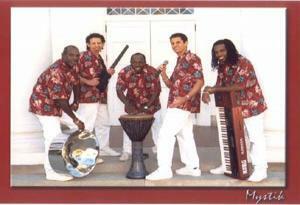 The Caribbean Crew is well known for their high-energy and interactive performances. The Caribbean Crew offers a wide variety of original and cover music, from traditional reggae and calypso, to modern day soca and dancehall. 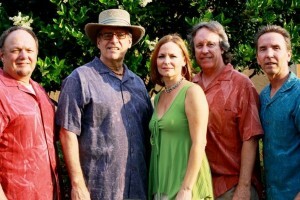 They also perform many Top 40 hits, as well as Jimmy Buffet selections The Caribbean Crew is the ideal band for corporate events, weddings, pool parties, dances, hotels, private functions, or any other special event. Turn your party into the ultimate beach bash with Coco Loco. These highly acclaimed musicians will create the perfect mood for you and your guests. Complete with hula hoop and limbo contest, this band is all about audience participation. Coco Loco’s never-ending song list covers it all, from background music to beach party favorites! Your guests are sure to dance, sing, and Twist and Shout the night away! Hailing from the Caribbean islands of Trinidad and Tobago, this unique blend of youth and experience brings a new image and sound to the masses. Deja’s repertoire includes a variety of Reggae, Calypso, Soca and top 40 selections. 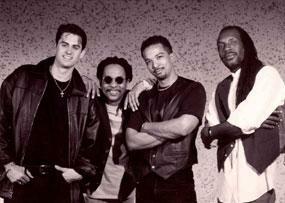 They perform regularly at Bob Marley’s at Universal City Walk. 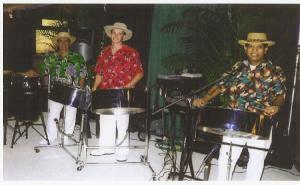 Island Groove is a versatile, mobile, and stationary 3/4-piece steel drum band that specializes in convention, theme park, and atmosphere entertainment. Island Groove performs fun, upbeat island music with a splash of meringue and salsa beats which allows for great crowd interactions. Island Paradise is the ultimate choice for your “big-bad” beach bash or plain old poolside party! Caribbean Reggae & Soca, “Buffett”, Beach Boys and Beach (Shag) music styles are covered. Conga lines, limbo contests, sing-a-longs and lots of audience interaction are part of what’s in store. The band includes guitar, keyboards, drums, bass guitar, and multiple lead vocals. 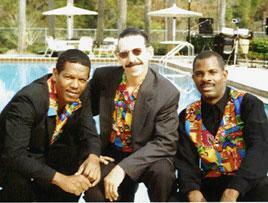 A steel drum player, percussionist and/or dynamite three-piece horn section are frequent add-ons for the band. Paradise has been making party music together for over 15 years and has performed for corporate throughout the Caribbean and around the world. Versatile, professional and experienced, Island Paradise has been the entertainment choice for hundreds of corporate meetings, receptions and parties. Local clients include Walt Disney World Company, Universal Studios, The Orlando Magic, Church Street Station and Sea World. Other satisfied clients include: McDonalds, AT&T, MCI, Roche, Eli Lilly, Prudential, American Express, Microsoft, Compaq, Lotus, American Association of Cardiologists, Legal & General, Wendy’s and Fuji. So, kick your shoes off, grab that limbo stick or a hula hoop and have a blast! One of Orlando’s premier live Reggae, Soca, and Dancehall groups representing St. Kitts, Jamaica, Trinidad & Tobago, and the US. Mystik NRG performs a unique blend of music absolutely guaranteed to make your party move! The band is honored to have performed for four of the six Bob Marley Reggae Fests, hosted by Universal Studios CityWalk in Orlando FL, and to make the Bob Marley Tribute To Freedom club at CityWalk their home base. The three-piece band is ideally suited for smaller hotel, restaurant, and poolside events. The lineup can also expand to a five-piece or larger, adding steel drums and other instruments to create a fuller, more “Caribbean” sound. 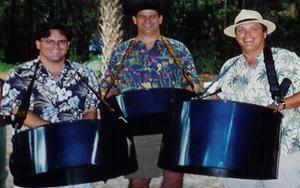 “Pop-N-Steel” strives to set itself apart from other steel drum bands heard locally. Besides performing popular tunes from such artists as Harry Belafonte, Bob Marley, and Peter Tosh, Pop-N-Steel’s” repertoire includes Grammy Award-winning songs like “Unforgettable” by Nat King Cole and the theme from Beauty and the Beast, both arranged with a Calypso rhythm. Other audience favorites are “The Little Mermaid” and “Kiss De Girl”, sung by Sebastian the Crab. The Restless Natives are professional musicians that were actually born right here in Central Florida! They have worked in the entertainment field since they met in high school and continue to work together today as one of the most talented and versatile duo-trio available. With thousands of professional bookings to their credit, they have the ability to perform instrumentally on steel drums, or add vocals, guitar and percussion. 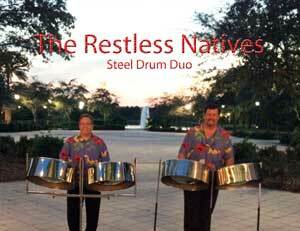 The Restless Natives will add the perfect vibe to your next tropical themed event. 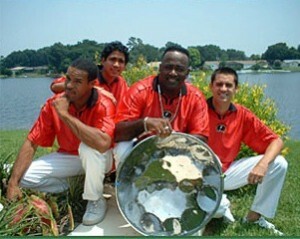 A native of Trinidad, John Smith leads this talented group of musicians performing a wide range of Caribbean music. John is a steel drum wizard and gifted vocalist. Although the band is able to perform all of the island and calypso favorites, Tropical Steel has an acute fondness for Reggae in the tradition of Bob Marley. His influence is felt throughout their performance. 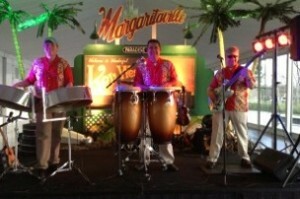 From light background to high-energy party music, Tropical Steel will set the right tone for your island theme party. Prepare for an explosion of unusual proportions. 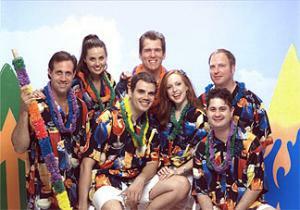 Volcano Joe & the Hot Lava Band have burst onto the scene with the hottest beach party music. The Good Times will flow all night as Volcano Joe leads your guests in an unforgettable beach ball volleyball game on the dance floor, and of course a first-class conga line!